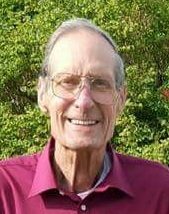 Vernon Eilers, 83, of Schuyler died Friday, January 5, 2018 at Countryside Manor in Madison. Funeral Service Thursday, January 11, 2018, 11:00 A.M.
Vernon J. Eilers was born September 25, 1934, west of Madison, Nebraska to John "Jack" Rhinehart and Goldie Mamie (Peterson) Eilers. He started school in Madison at the age of four. When he was 18, he enlisted in the United States Navy, serving four years. Vernon was a Petty Officer 2nd Class on the USS Blue Destroyer. On May 14, 1955, Operation Wig Wam was performed--an under water 30 ton Atomic blast. On February 2, 1956, Vernon crossed the equator at Melbourne, Australia. Before crossing you are a "polywog" and after, a "shell back". On November 17, 1962 he married Marilyn "Sue" Legler in Fremont. They lived in Schuyler where Vernon worked for Wagner Mills from 1958-1976, driving truck and doing electrical maintenance. In 1977, he started Eiler's Electric and ran his own business until 1989. In 1991, Vernon started work for the Schuyler Department of Utilities, where he worked until retiring in 2005, at the age of 70. Vernon had served as an elder at the First Presbyterian Church and was a Lifetime Member of the VFW and American Legion, serving as VFW Commander from 1971-1975 and held numerous offices in both the VFW and Legion. He also served many years on the Funeral Honor Guard. Vernon and Sue were known on occasion to visit the casinos. Vernon is survived by one daughter, Shelly (Tim) Noonan of Schuyler, one son, Hayden (Andra) Eilers of Columbus, two sisters; LaVonne Stone of Columbus and Patricia (Gus) Strauss of Lincoln, a brother Roger (Betty) Eilers of Grand Island, four grandchildren; Aaron Eilers and friend Ashlee Johnson, Ashley and Clayton Eilers and Zachary Noonan and his fiancé, Cailey Heavican, and two great-grandchildren; Isaiah and Talon Eilers. He was preceded in death by his parents, wife Sue, sister, Sharon Eilers and a brother, Bob Eilers.